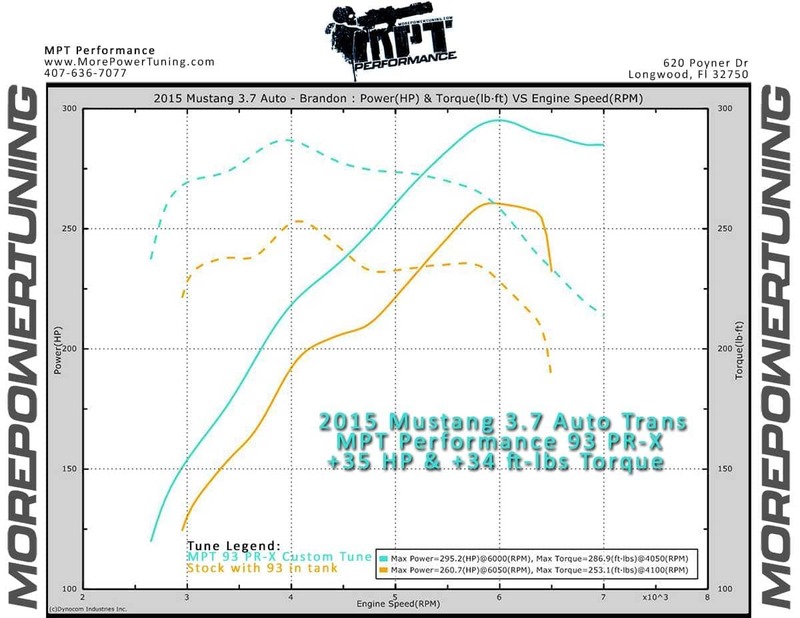 PR-X, also known as Performance Race Xtreme, is our top-performance tune for the Mustang with a massive dyno proven gain. This is by far the preferred tune on this truck due to the power gains over stock. The vehicle feels so much lighter with the increased throttle response and part throttle power. With this tune you are looking at huge increases in low end torque and acceleration, faster 0-60 times, quicker 1/4 mile results, the shift points optimized with a focus on performance. The shift points will happen at a higher rpm/mph than stock and will be firmer than stock. This tune has all the benefits of the above PR-X but has the trans setup very mild for those that prefer the stock feeling shifts. Octane: Gas vehicle tunes are heavily impacted by the octane of fuel being used. If you want power, run higher octane. Running a higher octane allows us to advance the spark more which results in better performance. That being said, you should pick tunes for the octane you plan on running. If you always have and always will run 87-89 octane, then that is what you should choose. You can run a tune for 87-89 octane and fill the tank with 93, however you cannot run a tune for 93 octane and fill up with 87-89. Doing so will result in knock activity, a loss of power output and in rare cases, possible engine damage. Our recommendation for performance tunes is to run the highest octane available . Tire Size: We apply your tire size to the calibration if you have changed it. Axle Ratio: We set up the tune based on your axle ratio if you have changed it.